President Obama should express condolences for the Australian baseball player killed this week in Oklahoma, that states governor said Sunday. I think it would be a nice gesture for him to do that, especially since the country of Australia has expressed its sentiments as to the murder itself, Gov. Mary Fallon (R) said during an appearance on Fox News Sunday. Lane was killed in a shooting in which three teenagers shot him while he was jogging. The teens said they killed him because they were bored. The silence over Lane's shooting has infuriated conservatives, in light of the extremely vocal stance Obama personally took during the Trayvon Martin shooting. Don’t hold your breath, governor. Of course he should...but he won’t. If 0bama had sons, they would kill white people because they are white. Obama doesn't care. Mr. Lane didn't vote for him. The president was equally mute and confused for a month on the Martin shooting before he spouted out something useless. Colon Powell is also silent. The Governer and the Mayor of the town should go ahead and write to the parents themselves. Acting stupidly, Obama interjected racial divisiveness into the Officer Crowley/Professor Skippy Gates matter immediately before all the facts were in, only to be dissed by law enforcement professionals who verified that Crowley acted correctly and 100% by the book. 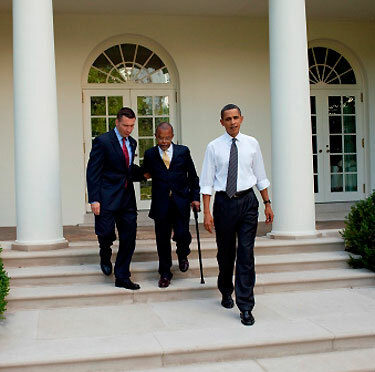 Then, in an effort to save face Obama hosts a "beer summit" only further making a damn fool of himself by being photographed swaggering ahead while the "racist" white officer helps the crippled black friend of Obama down steps. Likewise, Obama immediately put his racist spin on the Zimmerman/Martin affair giving the green light to his sycophants in the lame stream media to go 24/7 Trayvon --- inspiring the New York Slimes to coin the term "white Hispanic" for Zimmerman to make sure the low information voters of the Obama electorate get the racial message. Ditto NBC for editing the Zimmerman (a dem who voted for Obama) 911 audio tapes to make him sound racist. Too much time has passed for Obama comments on the Lane murder (a TRUE racist attack) to be sincere, and I sincerely question whether the narcissistic, arrogant jackass can be guilt-tripped into making even a late statement.